If you were to get into a friend’s motorboat and ask him or her, "how far can you travel in the boat?" and "how fast does it go?" you would have to consider the following elements in order to get a reliable answer: the power provided by the engine, the amount of fuel available, the size of the propeller and the engine setting that gets the most efficient fuel to distance ratio. If you change any one of these elements you will get a different answer. The same is true in kayaking. When you get in a kayak your body is the engine. As we will see, you have different engine settings, which provide different levels of power. How much fuel you have and the size of your propeller, when you kayak, are subjects for future articles. This article is meant to focus on “Your Paddling Engine”, so you can begin to explore the different engine settings with your ultimate goal to find out which engine setting gets your the best fuel to distance ratio, while enjoying your paddle. I believe there are three significantly different ways you can use your engine when paddling. Each of these engine settings provides different degrees of power. We will assume you are using the same paddle, which is your propeller, when you compare the three engine settings. We will also assume you are taking the stroke the same way since stroke angle, blade path, blade angle and stroke length can also change the results of your stroke. When you take a stroke, the boat, the paddle, and King Neptune don't care how you move that paddle in order to move your kayak. The people who will care are the ones in your group if you are holding them up or if you are sprinting away from them. Your own body may care if it is getting tired and sore. Regardless of how you move your kayak, your muscles will be using your fuel (your bodies' energy stores) to move the kayak. Hopefully your goal is to use those energy stores efficiently. I will add a quick note that using energy efficiently does NOT always need to be your goal. Since you are not a machine, as is the motorboat, you have other needs, desires, feelings and a sense of order that also needs to be considered. So when we examine the three different engine settings remember, many if not all of the variables I have mentioned will affect the result of your stroke. Just for a quick anatomy review, your muscles are attached to your bones. Your muscles also cross over joints. When a muscle contracts it causes movement at the joint it crosses. Your joint determines your range of motion. You can also use opposing muscles to keep the joint from moving. I will refer to this as static power, which means your muscles are working to stabilize and or keep a joint from moving. As a quick example, your muscles' using static power keeps you in an erect position when standing. If there were no static power, you would collapse and end up on the floor. After gripping your paddle with your hands, you can move your paddle just by using your arms only. The arm closer to the water would be using the biceps muscle to pull and the other arm would be using the triceps muscle to push the paddle. I will refer to this arm movement as dynamic power, because the joint is moving. If you are strong and specifically trained to paddle this way, I am sure you could keep up with an average group for most of the day or the full day. Before I go any farther, I want to make it very clear that I am not suggesting you paddle just using your arms. The reason I discuss arm only paddling is because paddlers who have NOT had any formal instruction will typically paddle just using their arms. I have met paddlers who've paddled most of their life using arms only and they never have had a problem getting their kayak where it needed to go. For this article, we can refer to arm only paddling as the low engine setting. In this picture I am leaning back, with my feet off of the foot pedals and I am just using my arms to move the paddle. You can see the bend in the elbow and more importantly, the paddle shaft is not parallel to my torso. If we were to compare the size of the muscles between your arm muscles, your trunk muscles and your thigh and leg muscles, your arm muscles would be the smallest. With that in mind let's look at other ways to make your paddle move. No matter what engine setting you use, your arms will always be working. The difference in the work can be dynamic power versus static power. If you were to put your blade in the water, and grip the paddle shaft with your hands, while providing static power with your arms, you could move your paddle by rotating your torso. Moving your paddle in this manner takes advantage of the larger trunk muscles to provide the power for the stroke. In order to use your trunk as a power source, you need to have your feet stabilized on your foot pedals. If you did not have foot pedals and your feet were moving freely in the cockpit, when you try to take a stroke with your trunk your feet would move to the side until they hit the side of your kayak. When your feet stopped moving you would get the resistance you wanted from using your trunk muscles. However, why waste all that energy of having your feet moving from side to side in your kayak when you are trying to take a stroke. That is why solid foot pedals are important. The foot pedals provide stability so your trunk movement moves your paddle; as long as you are arms are in a static position. 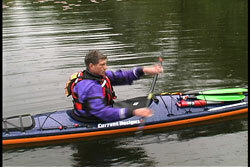 Paddling with torso rotation and static arms could be considered the medium engine setting for paddling. In this example you can see the paddle shaft is kept parallel to my chest with my static arms. I need to use my torso to move the paddle. There will be movement in your elbows at the end of the stroke. If you have been paddling for a while you may have probably heard someone say, "push on the right foot pedal when you take a forward stroke on the right side and push on the left foot pedal when you do a forward stroke on the left side." Correctly pushing on your foot pedals, while paddling, can provide more power to your stroke. I would like to explore, in greater detail, what is meant by pushing on your foot pedals. To get the most power for your forward stroke you should not only press on your foot pedals you should try to straighten your leg during the stroke. If you were to drive off of your right foot pedal and straighten your right leg something has to move to allow your leg to straighten at the knee. If your foot pedal is in a fixed position and you use your leg muscles to hold your foot in a static position, then the only other place for movement would be at your hip. By driving off of your foot pedal, as I have just described, you would be driving your hip backwards. By doing this you are providing more power to your stroke when using torso rotation. When I use the term, “full body paddling”, I am referring to paddling while driving your hips back during each forward stroke, while using torso rotation and static arm power. Full body paddling would be the high engine setting. In this picture you can see my right leg is straight. My feet are held in place against the bench, which is simulating your foot pedals in the cockpit. That means my right hip had to move back when I straightened my right leg. In my experience, the vast majority of experienced paddlers, who paddle with torso rotation, do not drive their hips back with every stroke. They are using their foot pedals for support so they can use torso rotation. If there is leg movement, by those paddlers, its minor leg movement. I can honestly say driving your hip back with every stroke takes a lot of energy. You also have to remember to drive your hip back while you are paddling. Many paddlers have told me they understood that "pressing on the foot pedal," meant to use the pedal as support and just press with the foot. They did not realize it meant driving off of the foot pedal and straightening the lower limb at the knee. The paddlers who seem to use the hip drive regularly are the ones that usually race. For the average paddler, hip drive is usually reserved for sprints or when extra power is needed. I am not suggesting that the average paddler should not be using hip drive. I am just reporting my observations and the information I have gathered by asking hundreds and hundreds of paddlers. There could be any number of reasons why a paddler would choose not to use hip drive with every stroke. I can honestly tell you that even during races, where I should be using hip drive, I sometimes forget to do it if it's a long race. Since I am not a professional racer I still have to consciously think about all the moving parts when I am racing. When I am sprinting for a prolonged period of time my mind starts to wander and when it does my hip drive diminishes. Another reason for not using hip drive could be lack of energy stores. Sustainability of your stroke style is a topic unto itself. If you are not in condition and you do not have enough energy stores built up, it is difficult to use and maintain full body paddling for long distances. In this picture I am using torso rotation and I am pressing with the correct foot during each stroke. There is a slight bit of movement at the knee, but it is NOT a full hip drive with my leg straightening out. I still need foot support to paddle this way. In fact, you need to have your feet supported if you want to maximize your power while using torso rotation. As I mentioned earlier, if your feet move, because you do not have them supported on foot pedals you will end up wasting energy. There are times, during long day tours, where I needed to stretch my back and rest my torso. At the same time I didn't want to stop my forward momentum. That is when I take my feet off the foot pedals; slide forward in my seat, lean back on the back of my coaming and paddle using arms only. I do this for about 5 to 10 minutes. Then I'll sit back up, put my feet on the foot pedals and go back to paddling with torso rotation. I am one of those paddlers who press on the foot pedals, but does not use hip drive during my normal touring stroke while using torso rotation and static arm power. I save the full body paddling when I need to sprint to the front of the group, quickly get through a surf zone, when I need to tow someone, during racing, in strong head winds and any other time I need my engine to be working on high. It is easy to say one should paddle with full body paddling all the time. Saying it and being able to do it are two different things. When you get in your kayak it is important you find a paddling style and rhythm that fits your sense of order and your bodies' energy stores. Now that you know you have three engine settings, you can decide which one to use and when to use it. When you're paddling by yourself no one is going to care. When you're paddling in a group it's nice to be able to stay with the group and not slow it down. It's also advantageous if you have the power to tow someone in an emergency. So the next time you get out on the water think, about "Your Paddling Engine" having three settings. Just for an experiment take your feet off the foot pedals and paddle using arms only for five minutes. Then put your feet back on the foot pedals and paddle with torso rotation and static arm power. After that, try full body paddling where you are driving your hips back with every stroke. After using the three different engine settings you can decide when and where each one works best for you. If you were to compare the three different engine settings over a short distance (1 to 2 miles) there is very little doubt in my mind that you will cover that fixed distance faster with full body paddling. However, how long can you maintain full body paddling? Your energy stores and your strength best answer that question. This takes us into the realm of sustainability, which I said earlier, is a topic for another day. The only true way to decide which of these engine settings gets you the best fuel to distance ratio is by comparing three different trips. Each trip would have to be done until exhaustion using the three different engine settings. The winner will be the one where you traveled the farthest. Since this is not really practical and probably unsafe (there are also hidden variables) you will have to decide this by your own empirical research (how it feels to you). Try using and maintaining the three different engine settings on three similar day tours. After, compare your results of the three trips (pace, your fatigue, energy at the end of the trip, your enjoyment and comfort level) and decide which engine level works best for you. If you are like me, you will end up using all three settings as needed and find one for general touring. If you want more details regarding stroke mechanics, this topic plus many others are included in our new video “Essential Kayaking Strokes”. Our new strokes video is 3 1/2 hours long and not only includes how to perform the strokes, it includes the many elements you need to consider behind the strokes. 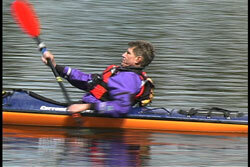 Go to the "Essential Kayaking Strokes" info page for more details.